The Danube-Class Runabout was designed to complete four general mission types. Short Notice and/or Emergency Response Transportation for Scientific Expeditions or Medical Personnel. Act as a Base of Operations (orbital or landed) for Scientific Expeditions or Medical Response. Transport personnel, intact experiment and/or cargo modules. Perform tactical missions such as intelligence gathering (scouting), covert insertion/extraction of personnel, act as a deterrent of threatening situations, etc. Requirement of a warp capable shuttlecraft was issued in the 2340s. The development of such a warp capable shuttle was to be capable of short and medium range missions and assignments. The original Type-10 runabouts were created, but soon we found to be limited in their size. The development of the Danube-Class runabouts began in 2363. They were first introduced in 2368. The Danube-Class runabouts feature a front cabin for four. The pilot, co-pilot/operations, and two mission specialists. There is also a two person transporter in the rear of the front cabin. Aft of the front cabin are the mission specific modules. Based on the nature of the modular design, the runabout can be converted to other mission-type specific requirements such as personnel transporter, cargo transporter, scientific expeditions, tactical assignments, prison transports, medical transports, etc. There is also an optional photon torpedo module on the top of the Danube-Class runabout. The impulse engines are constructed from eight fusion reactors divided into two sets, space-time impulse drive coils, and vectored exhaust directors. The engines also include intake vents for atmosphere or interstellar travel. When maintenance is required, the impulse drive assembly can be removed. The Danube-Class computer core, which measures 2.3 x 2.1 x 1.3 meters, is located under the cockpit. The core is a standard isolinear unit with 186 isolinear banks and 53 command pre-processors. Sub nodes are installed throughout the runabout and are connected to the core by standard optical data network relays. 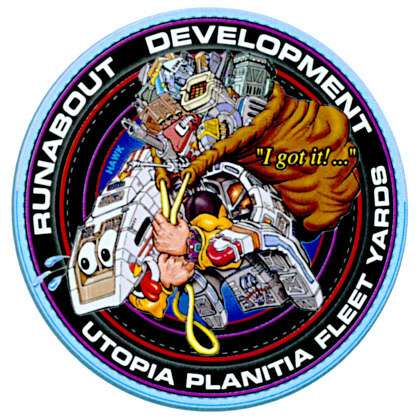 Why didn't you mention each runabout was named after a river on Earth? Although it is true the ones we have seen on DS9 were named after rivers on Earth, this may just be the preference of the station commander. Does it use Bio-Neural Gelpaks? No. The Danube-Class runabout is older than the Intrepid. I have no idea. We have seen quite a few of them blown up on DS9. DANUBE-CLASS SPECIFICATIONS CREATED BY: Jon L.
DS9 Technical Manual - Pocket Books Ltd., Simon & Schuster Inc. The Official STAR TREK Fact Files - GE FABBRI Ltd., Aerospace Publishing Ltd. Copyright 2001 - Star Trek : A Call to Duty. Use of these specifications is restricted to the Star Trek: A Call to Duty Roleplaying (ST:ACTD) Technical Specifications domain at http://techspecs.acalltoduty.com and may only be reproduced with the express permission of the ST:ACTD on sites that clearly serve to provide information on ST:ACTD, its various ships and stations, or other related topics. Editing the contents of the information present on this page or reformatting the way in which it is presented is not permitted without the direct permission of ST:ACTD. Wherever possible, published sources were consulted to add to the wealth of knowledge in this document, and in some cases, this text was reproduced here. Sources used are properly cited in the "Credits and Copyright Information" appendix. No copyright infringement is intended.